My favorite time of year my spookies!!! I love it when I can call you 'my spookies'. It's OCTOBER 1 and I'm going to slap you with not one, but two Halloween booklists this week, so you can RUN, FLEE and DASH to the library and be able to read Halloweeny books all month long. 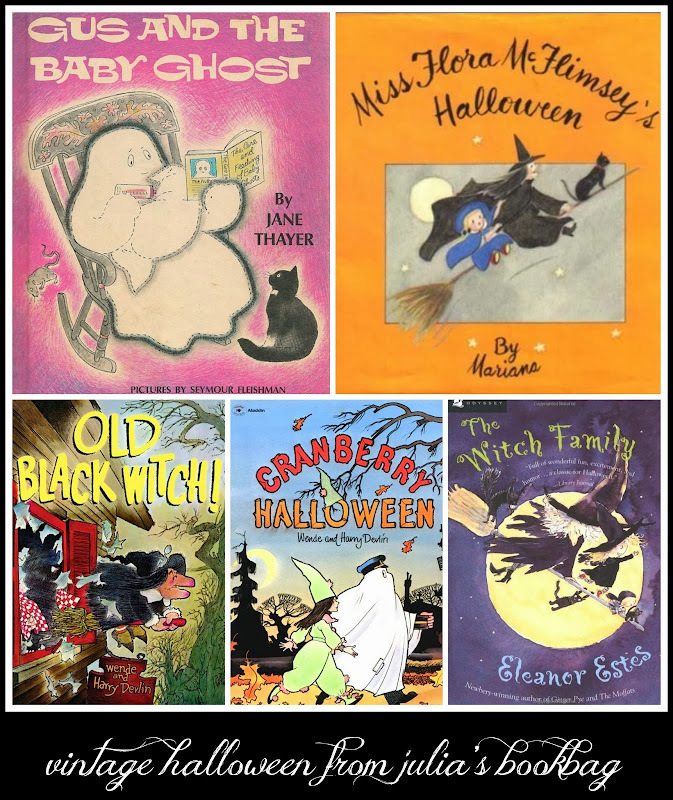 Pretty sure that I've mentioned 'Gus and the Baby Ghost' by Jane Thayer before but lets have a deeper conversation about it. I own this book, and I've owned it since I was 5 or 6. THAT'S A VERY LONG TIME TO KEEP A BOOK. I kid you not, it was my favorite book from that age. I was obsessed with this book. A sweet ghost takes in a baby orphan ghost, much to the chagrin of his cranky human museum curator friend. THEY CHANGE BABY GHOST'S DIAPERS! You must seek out this book. Just got 'Miss Flora McFlimsey's Halloween' by Mariana from the library and I'm stoked, yo, because I own and love her 'Easter Bonnet' book. Cute cute cute! She has a cat named Pookoo. That should sell you right there. Flora is a little doll who has adorable adventures. It doesn't matter what she does, it's all adorable. In this story, Flora's home is overrun by goblins. Last year, I bought the newly reissued 'Old Black Witch' by Harry Devlin, and Julia and I read it over and over and over. If you only look for one book on this list (you're misguided and shortsighted, let's imagine), go for this one. OMG I love it so much. A witch who wakes up after 200 years and her house has been turned into a tea shop. TEA SHOP and WITCHES!!!! So fun and the art, can you believe her face? The awesomest. I'm excited for 'Cranberry Halloween' because 'Cranberry Thanksgiving' is utterly fantastic and these books are just old-fashionedy little stories about life in a small New England town. And guess who wrote it?? SEE THE ABOVE conversation about 'Old Black Witch'. Ah, 'The Witch Family' by the great Eleanor Estes. So, I read this book as a 4th grader and I was beyond enchanted. I just couldn't get enough of this book. But it was a library book and we parted ways and I never owned a copy and then I forgot about it and then I tried to remember the title and couldn't and I had to scour the internet and I finally found a site (which I can't recall, Stump the Bookseller or something?) and I remembered the title and ordered the book! And now Julia is old enough to have it read to her!!! AND I AM SO HAPPY!!!!!!! A witch family. Created by two little girls' imaginations, but they become real. A little witch girl who goes to witch school and has A BEST FRIEND WHO'S A MERMAID and lives in a cave of crystal glass. This book is seriously magical. If you have a 7-10 year old girl who has not read this book, go get it RIGHT NOW. I am so gloriously excited that it's Halloween-time! I'm so thrilled to see "Old Black Witch" and the Cranberry Series on your list! Cranberry Thanksgiving was my favorite book as a child and I'm eagerly awaiting it's arrival on my doorstep. I can't wait to introduce my sons to Maggie and Mr. Whiskers! OMG I remember Gus. I think you just reached into my childhood too with that one. Awesomeness. RIGHT????? Gus is the BEST! And he's part of a series! I've GOT to track down some of his other books. I own Gus and I read The Witch Family at your recommendation last year. I was thinking of grabbing it for Big Sis, or having her check the school library for it. So excited for October!!!! I want to read The Witch Family just for myself LOL! Will have to print out your list and go to the library sometimes this week! I had Gus too! Good ol' Gus. I'm SO HAPPY others know and love the Gus books too!!!!! I loved the Gus books as a kid. Is there one where he has to use a calico sheet instead of a plain white one? It's been too long. OMFG LOVE the Cranberry books. I made my mom dig out Cranberry Valentine for me earlier this year. I really really really wanted to live in a Massachusetts village when I was a kid. I can't believe I've never read Old Black Witch. Just went to check if our library has it--nope. Might just have to buy myself a copy on Amazon. Plus, Cranberry Halloween, Thanksgiving, and Christmas are back in print. Woot woot! I'm seriously going to buy the whole Cranberry series. They are the sweetest and I want to reward Purple House Press for reissuing these amazing book!!! I grew up with one of the Gus books, but not the baby one. Must check it out! And I agree with everyone else about the Cranberry books! Love them! love Gus love Old Black Witch. will have to get The Witch Family, sounds so good! I'm so excited! I remember reading Gus and the Baby Ghost when I was a kid! I distinctly remember the ghostly diapers. I got a copy of it and The Witch Family from Alibris for a grand total of $12.50, lol. Thanks for making my day! hot dog! it totally makes MY day that so many people have fond feelings for one of my all time favorite books!! I have a 7-10 year old girl who has not read that!!! ITS LIKE YOU WERE SPEAKING DIRECTLY TO ME!!!!! Must find The Witch Family!! I was speaking directly to you! I absolutely was!